I know most gamers who converge upon at the Crossroads of America in Indianapolis for GenCon rarely have time to do anything else but game, talk about games, or shop for games. However, just in case any of my readers have some free time, arrive early, or leave later, I am writing a series of articles that present attractions and events that might pique your interest. This first article of the series deals with museums. This is probably my favorite museum and don’t let the title fool you, adults love it too. Their boxed text says it’s a nonprofit institution committed to enriching the lives of children, is the largest children’s museum in the world. The more than 400,000-square-foot facility houses eleven major galleries that explore the physical and natural sciences, history, world cultures and the arts. The Children’s Museum is a place to learn and do. Whenever possible, exhibits are “hands-on” or participatory in nature. The Children’s Museum strives to be one of the vital links in the lives of children as it supports their intellectual curiosity and love of learning. The museum, situated on 14 acres of land in Indianapolis, presents thousands of programs and activities each year. This year, there will be the HotWheels for Real and the National Geographic Treasures of the Earth (with a pirate shipwreck, Egyptian tomb, and terra cotta soldiers) exhibits. One of my favorite things to see there is the Dinosphere. If you’re in town and have any spare time, I HIGHLY recommend the Children’s Museum. The Children’s Museum is open daily, 10 am – 5 pm. This museum, along with the neighboring Indiana State Museum, is literally right across the road from the convention center. I was always fascinated with the American West (especially the Wild West) and this place could be the ultimate source of historical inspiration for many Deadlands gamers out there. What better way is there to spice up your Wierd West campaign than with actual artifacts and cultures from the American West? The Eiteljorg Museum is unique, one of only two museums east of the Mississippi with both Native American and Western art. Located in downtown Indianapolis, the museum is within walking distance of the Indiana Convention Center & Lucas Oil Stadium, Circle Centre mall and major downtown hotels. The building’s distinctive design was inspired by the land, people and architecture of the American Southwest. The American Western Gallery includes works from the Taos, New Mexico Artists’ Colony, as well as pieces from such legends as Remington and Russell. Contemporary artists who tell the story of today’s West are also represented and the Native American collection includes pottery, basketry, sculpture and other artifacts from all 10 North American native cultural areas. And it’s only getting better. The Eiteljorg is open Monday – Saturday: 10 am – 5 pm and Sunday: Noon – 5 pm. Just a short drive or bus ride from downtown Indianapolis on 152 acres of gardens and grounds, the Indianapolis Museum of Art is the fifth largest general art museum in the United States, with a collection of more than 50,000 works that spans a wide range of cultures and eras. The IMA has one of the most outstanding collections of Japanese Edo-period paintings in the nation. It also has significant holdings of African art, Chinese ceramics, West Asian rugs, fashion arts, and a rapidly growing contemporary collection from emerging and internationally renowned artists. The IMA is open Tuesday – Sunday, 11 am – 5 pm and Thursday – Friday, 11 am – 9 pm, closed Monday. I know there are some avid race fans out there in the gamer world, and Indianapolis is famous for the sport. We have the Indianpolis Motor Speedway (Home to the Indy 500 & Brickyard 400) as well the O’Reilly Raceway Park. I’ll cover racing events later, but for those racing history buffs, the Motor Speedway Hall of Fame is right up your gasoline alley. One of the world’s largest, most varied collections of racing, classic and antique cars is housed here featuring more than 30 Indianapolis 500 winning cars. Tony Hulman Theatre presents a 20-minute film depicting the history of the track and race highlights. Bus tours around track are available when track is not in use for racing or testing. 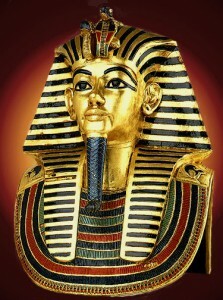 The museum is open daily, 9 am to 5 pm. For the wargamers and armchair war historians in the gaming community, a museum list would not be complete without something dealing with war. 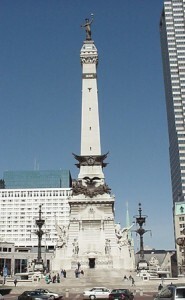 Recognized as one of the world’s outstanding monuments, the structure has come to symbolize both the City of Indianapolis and the state of Indiana. The Limestone used for the monument is gray oolitic limestone from the Romona quarries of Owen County. It stands 284 feet, 6 inches high, only 15 feet shorter than the Statue of Liberty. Located in the lower level of The Soldiers and Sailors Monument in the center of downtown Indianapolis this 9,000-square-foot exhibit explores the effects of the civil war on the people of Indiana. A historic and unique gallery space posed challenges for the design and production that in turn enhanced the visitor experience. Large rear projected local re-enactment video engages the visitor in real war situations. The Civil War museum is open Wednesday-Sunday, 10 am to 6 pm. 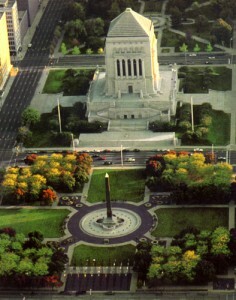 Dominating the five-block picturesque setting of War Memorial Plaza in downtown Indianapolis is the Indiana World War Memorial. Sitting 210 feet above street level, this mausoleum-style limestone and marble memorial pays homage to Hoosiers killed during World Wars I and II, the Korean War and the Vietnam War. The Shrine Room, with 24 stained glass windows, is a magnificent architectural setting for the 17-by-30 foot American flag that is suspended from the center of the room. The main floor houses exhibit space, administrative offices, meeting rooms and the Pershing Auditorium. Also on this level is a listing of the names of all Hoosiers who participated in World War I and all Hoosiers who were killed or are MIA from World War II, Korea and Vietnam. A military museum in the basement allows visitors to follow the history of Indiana soldiers from the Battle of Tippecanoe through the most recent conflicts. The IWM is open Wednesday-Sunday, 10 am to 5 pm. Certainly not a traditional museum, at Connor Prairie, the Smithsonian Museum Institution’s only Indiana affiliate, you’ll find that “Look, don’t touch” becomes “look, touch, smell, taste and hear.” As you explore five themed historic areas on 200 beautiful, wooded acres, you’ll discover more exciting, memorable ways to experience the past than your family or group can pack into a day. During the days from April through October, you’ll take in the hustle and bustle of pioneer Indiana, jump in and help with chores in a Victorian farm community or hold newly hatched chicks at the Conner Homestead. Throw tomahawks in an Indian trading post and feel the thrill of soaring 350 feet above Conner Prairie’s landscape in our newest historic area, 1859 Balloon Voyage. Did you read that? A Victorian era hot air balloon! Airship pirates-in-training apply inside. The Prairie is open Tuesday – Saturday, 10 am to 5 pm, Sunday, 11 am to 5 pm, closed Monday. Want to read more about conventions? Check out this month’s well timed RPG Blog Carnival hosted by Chgowiz. Also, you can check out my other articles on GenCon. Dude, I was gonna do a post much like this one for TGT. Now I’ll just link to this. .-= Daniel M. Perez, The Gamer Traveler´s last blog ..Keith Baker Launches “Have Dice, Will Travel” =-. I officially give permission to syndicate this post for The Gamer Traveler.